A self-guided cycling trip that follows the historic pilgrim route from Siena to Rome. From the classic Tuscan landscapes Of Val d'Orcia you ride past ancient fortresses, amphitheatres and hilltop towns south into Lazio. Your journey will start in Siena, one of the most beautiful towns along the Francigena. You will be able to spend the day walking through its paved streets, looking for coats-of-arms on the walls of the contradas (districts of the town) or climbing the Torre del Mangia to enjoy a unique view over the town. Not to be missed is a visit to the duomo, with its stunning black and white columns. If you are lucky you will be able to witness a festival in one of the contradas, and see the work of the skilled flag-throwers before sitting down at a table in Piazza del Campo to enjoy a plate of pici all'aglione (pasta with tomato and garlic sauce) for dinner, admiring the illuminated Palazzo Pubblico. Your bike will be delivered either today or tomorrow morning and you will be required to sign an agreement of care upon receipt of the bike. Today you will say goodbye to Siena and cycle along quiet dirt roads as far as the fortified village of Lucignano. After stopping to visit the town's beautiful church you will continue your journey through the Valle dell'Ombrone to Buonconvento. When you arrive in Buonconvento, pass through the gate and enter the fine walled old centre of the village, discovering why its name means 'happy fortunate place'. After taking a rest break continue cycling towards San Quirico. Along the way you will be rewarded with beautiful views of the Val D'Orcia, scattered with vineyards and cypress trees. When you reach San Quirico we suggest taking some time to stand at the gate of the Collegiata to recognise the various architectural styles that blend into its decorations, before enjoying a rest among the green hedges of the Horti Leonini, a fifteenth century garden. Your total cycling distance today is approximately 54 km with an ascent of 650 m.
After breakfast you will continue your journey, the fabulous views of the Val D'Orcia a backdrop for today's cycle. Just beyond San Quirico you will enter Vignoni Alto, a small medieval hamlet where you can rejuvenate aching legs by bathing in the thermal waters of Bagno Vignoni. You will then test your strength with a short but demanding leg of your journey which will take you as far as Radicofani, your legs may feel tired but admiring the view from the Radicofani fortress will make all of your efforts worthwhile. You will also be able to visit the Pieve di San Pietro, a little jewel dating back to the thirteenth century and take an evening walk in its old town centre admiring the magic of the illuminated fortress. Your total cycling distance today is approximately 37 km with an ascent of 650 m (if staying at La Selvella there will be an additional 5 kilmometres). 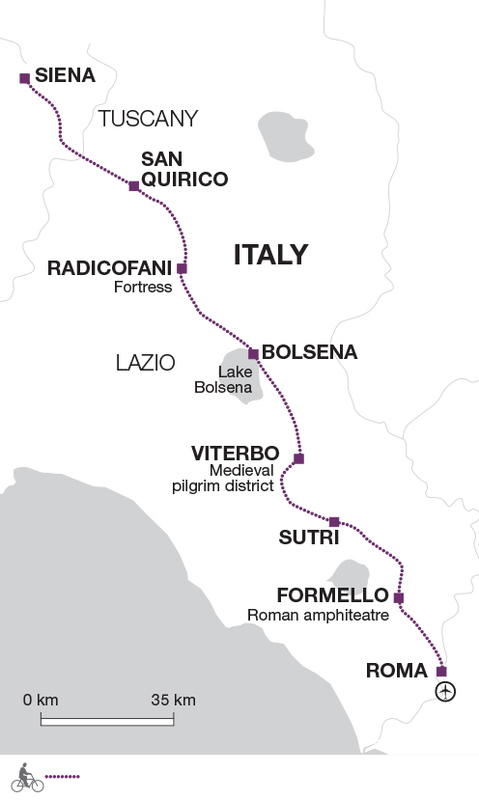 From Radicofani you will cycle towards one of the most exciting sections of the Via Francigena. Leaving the fortress behind you cycle along the old Via Cassia which is surrounded by stunning scenery, dominated by Monte Amiata. Hopping off the bikes for a short while you will be able to walk in silence in the Romanesque crypt beneath the Basilica del Santo Sepolcro. According to tradition some stones bathed in the blood of Christ are thought to have been kept here. Getting back in the saddle continue cycling until you reach the first views of Lake Bolsena. From here you will descend into a volcanic crater and continue riding along dirt tracks, amongst thick woods and meadows scattered with olive trees, until you reach Bolsena. The town is known for the miracle of the Corpus Domini and you can see the proof of this miracle in the Cappella del Miracolo, where 13th Century marble slabs, stained by blood pouring from a Host, are kept. Alternatively try some of the regional cuisine such as the Sbroscia, a typical soup made from lake fish and tomatoes. Your total cycling distance today is approximately 53 km with an ascent of 620 m.
Today's cycle passes through woods and olive groves on a route that will offer constant views of Lake Bolsena. You will cross an area famous for the production of extra virgin olive oil, which we recommend you try the delicious local bread, before arriving in Montefiascone. A climb up to the Rocca is not to be missed, which gives you stunning views. After descending from the Rocca perhaps go into a typical wine bar and taste a glass of 'Est!Est!!Est!!!' (a classic local Italian wine). If you want to spoil yourself a little more then consider recharging your batteries in the thermal waters of Bagnaccioa, before proceeding towards Viterbo which is the end of today's journey. Do not miss visiting the picturesque pilgrim's quarter, before admiring the splendid Palazzo dei Papi and enjoying the silence of the Longobard cloisters of Santa Maria Nuova. To end on a sweet note celebrate the end of the cycling today with a delicious local frittelle (a type of local fried doughnut). Your total cycling distance today is approximately 33 km with an ascent of 545 m.
From Viterbo the journey continues towards Vetralla, a town in the heart of the ancient Etrurian territory. After exploring the town continue cycling through the green countryside of Lazio and arrive at Sutri, a small town rich in attractions. The Roman amphitheatre here, completely dug out from the hill, is something not to be missed. Perhaps either sit on the terraces or climb up on the stage, but as you leave remember to sign the visitors' register. This is very important for the custodian and if he is there he will invite you to do so. After this visit proceed to the church of Santa Maria del Parto and view the well preserved frescoes. Look among the images for the group of pilgrims depicted in prayer with their sticks in their hands. Your total cycling distance today is approximately 38 km with an ascent of 420 m.
From Sutri cycle towards Campagnano and the Formello. During the journey you will flank the Mount Gelato Waterfalls where you can stop for an invigorating dip. Following a road on the edge of the Veio Nature Park will bring you to the gates of Campagnano. Here you can rest in the Venturi Park, the home of a three-hundred year old Yew tree. From here continue cycling through the beautiful Valle del Sorbo before reaching historic Formello, where you stop for the night. Your total cycling distance today is approximately 34 km with an ascent of 525 m.
Climb back on the saddle for the last leg of your journey today before you arrive at the Eternal City of Rome. You will start by cycling through the Veio Nature Park with its woody hills, before entering the enchanting Valle del Sorbo. Along the way you will be able to admire the sanctuary of the Madonna del Sorbo and the old town centre of Formello with its fine medieval buildings. You will have to cross a small section of main roads to reach the cycle path of River Tiber, an enchanting path which will lead you right to the gates of Vatican City, where you will be able to end your journey in St. Peter Square. Do not forget to take a triumphant photograph in front of the Basilica before celebrating the end of the journey fortifying yourself with spring lamb, pecorino romano cheese and perhaps a delicious maritozzo with cream. Your total cycling distance today is approximately 34 km with an ascent of 155 m.
Day 1 - Depending on your arrival time in Siena it is worth visiting the Cathedral. Day 8 - Rome has lots to see and do and again if time before your return flight perhaps visit the Colosseun or the Pantheon. Bring cycling gear such as quick drying cycle tops, padded cycle shorts and cycle gloves. We suggest bringing layers of clothing and remember that it can be cool at night or during the day at the start and end of the season, so bring a warmer jacket/fleece. A raincoat is essential at all times in case of rain. Bring one main piece of baggage as per your airline luggage allowance, maximum 20 kg per person. Remember you are expected to carry your own luggage if using public transport so don't overload yourself. Luggage transfers between hotels are normally arranged by the hoteliers and are restricted to one item per peson, extra items will be charged. Mark your bags clearly and leave them at the place and time arranged with them. When travelling on public transport you should always take your luggage with you. On all Explore cycle holidays we strongly recommend you bring along and wear your cycle helmet. In case of an accident resulting in personal injury, certain insurance policies are invalidated in cases where a helmet was not being worn. Cycle glasses to protect against dust, pollen and the sun, padded cycle gloves and a water bottle or water delivery system (e.g. camelback or platypus) are also useful. You may choose to bring your own gel seat cover for added comfort. If not renting a pannier we recommend bringing a small rucksack to wear while cycling. Other items to consider bringing are a sunhat and sun cream, torch, earplugs and insect repellent. If a handle bar bag or pannier is not provided (check bike details) then you may like to bring a small rucksack to wear while cycling. Please carry some or all of your cycling equipment e.g. helmet as part of your hand luggage. Local city tax is required to be paid in cash upon check in to the accommodation. The amount varies from 1 to 3 Euros per person per night, with the higher amount relating to higher category hotels. It is only applicable to a number of towns and cities in Italy but it is being rolled out to cover more places in time so please allow accordingly in your budget. Arrival into Pisa or Florence and departure from Rome. We recommend arrival flights to Pisa or Florence and departure flights at the end of the trip from a Rome airport. Pisa and Rome are served by both budget (including Easyjet, Ryanair) and non-budget airlines (including British Airways) from multiple airports in the UK. Florence has direct flights from London with Iberia and indirect flights with several airlines from regional airports. Take a PISA MOVER shuttle bus from the airport (departs every 10 mins, 5 mins journey, around 2.70 Euros) OR take a LAM ROSSA bus (departs every 10 mins, 15 mins journey, around 1.20 Euros) to Pisa train station. From here take a train to Siena, connecting via Empoli (journey takes 1 hour 45 mins, around 10.50 Euros). Siena train station is located outside the city walls. Take as local bus or taxi from the train station to Piazza Gramsci. Take a VOLA IN BUS airport shuttle bus from the airport to Florence SITA coach terminal, located adjacent to the train station (25 mins, around 6 Euros). Then travel by train to Siena, by either direct service, or change at Empoli (1-2 hour journey depending on train, around 9 Euros) and take a taxi from the train station to Piazza Gramsci ( 15 mins, from 20 Euros). Alternatively you can travel by bus from Florence to Siena with TIMME Spa (1 hour 35 mins, around 8 Euros). From Rome Termini train station either take a taxi (from 35 Euros) or travel by bus to the airport. SIT Shuttle bus or Terravision bus both stop just outside the train station and run at regular intervals (from 35 mins journey, 4 Euros). Either take a taxi from Rome Termini train station (from 45 Euros) or travel by bus to the airport. SIT Shuttle bus or Terravision bus both stop just outside the train station and run at regular intervals (from 1 hour journey, around 6 Euros). Alternatively take a Leonardo Express train directly to Fiumicino train station at the airport (30 mins, 14 Euros). 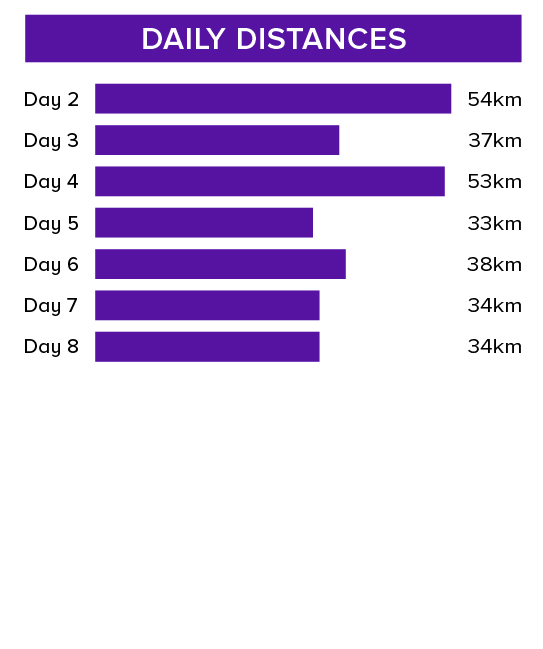 On this journey you cycle 283 km over seven days (an average of 40 km per day). 27 gear Hybrid Bike. E-Bike available at additional cost. Your included bike is a 27 gear Hybrid Bike and will be the correct frame size for your height. A map holder, water bottle holder and lateral rear pannier bag are included as well as the facility to fit your own standard size pedals or saddle if you wish to bring them (bring your own multi-tool). A lock, pump, spare inner tube and puncture repair kit with tyre levers is included. All you need to bring is your own helmet. You will be required to sign an agreement of care upon receipt of the bike. Wed 10 Apr 2019 - Mon 3 Jun 2019 Your trip can depart anytime between the above dates. Contact us for triple room requests and solo traveller prices. Tue 4 Jun 2019 - Thu 27 Jun 2019 Your trip can depart anytime between the above dates. Contact us for triple room requests and solo traveller prices. Fri 28 Jun 2019 - Tue 9 Jul 2019 Your trip can depart anytime between the above dates. Contact us for triple room requests and solo traveller prices. Wed 10 Jul 2019 - Fri 26 Jul 2019 Your trip can depart anytime between the above dates. Contact us for triple room requests and solo traveller prices. Sat 27 Jul 2019 - Sat 24 Aug 2019 Your trip can depart anytime between the above dates. Contact us for triple room requests and solo traveller prices. Sun 25 Aug 2019 - Sun 15 Sep 2019 Your trip can depart anytime between the above dates. Contact us for triple room requests and solo traveller prices. Mon 16 Sep 2019 - Mon 30 Sep 2019 Your trip can depart anytime between the above dates. Contact us for triple room requests and solo traveller prices.